Chris: Aside from its two basketball teams, two baseball teams, two soccer teams and one hockey team, if Los Angeles could get one additional team, it needs to be an electrical team who could help the state prevent more blackouts. Somewhere near the bottom of the list would be an NFL team, if only for the chance that they would break into the Rams’ facility in St. Louis, pilfer their uniforms and sign Jim Everett to play quarterback. I was quite fond of the Los Angeles Rams. Brad: LA doesn't need an NFL team. There is so much going on in LA, and that could make the team suffer. There would be a lot of partying and trouble that the pro players could get mixed up in. Plus, with everything LA has to offer, it could take away part of a fan base that would be there. I also think that with that many people in one place, fights are bound to happen; and that results in fans getting hurt, and that hurts the team. Joe: Los Angeles needs another sports team like Oz needs another wizard. Already too many teams, too many other activities and way too many stars. Ralphie: I really don't think there should be. They've already had 2, the Raiders and the Rams, and that didn't work. I think they should just try somewhere else. Brad: If a team needs to be there, then it should be an expansion team and not an established team. Maybe an expansion team could build from scratch and do what the others could not and find a comfortable home in LA. Ralphie: I guess I'd rather see a current team go there. At least they'd have a fan base to start out their time in L.A.
Chris: I have the utmost confidence that if fans and Los Angeles as a whole decide they do or do not want a professional football team, and if they do want a team, if they prefer an expansion team or relocated franchise, that they will have their voice heard by Roger Goodell, who will then ignore their desires and do the opposite of what is wanted. Joe: If a team was to go to LA, it should be expansion. Why deprive an existing city of a tenured franchise? TV makes the franchise valuable, not ticket sales or concessions or for that matter--fans. Chris: An expansion team in Los Angeles would upset peaceful lovers of symmetry. Brad: I definitely think a new team would find the same problems and eventually move. There are too many people and too many conflicts for a team to be able to stay in LA and thrive. Chris: Since an NFL team is not needed in Los Angeles, I suspect that Goodell will decide to put one there, most likely a relocated team from a smaller market. Jacksonville losing its team would not engender (I just said “engender”) a sufficient enough level of animosity towards Goodell. The Packers, however, are an ideal candidate, seeing as how relocating them would allow Goodell to make more money, while simultaneously demonstrating his ability to soil an entire city. Brad: I would say bring back the Raiders, but we already saw how well that didn't work! Ralphie: They should remember the problems the Raiders and Rams had. Joe: The Raiders’ past migratory habits were more a result of owner/commissioner wars than football logic. The Rams were an ownership changing of the guard and enormous amounts of money being poured into the owners’ lap in a makeup call for Bill Bidwell's dash to Arizona. Between college athletics, major sports and the movies, there is simply too much diversion in LA. 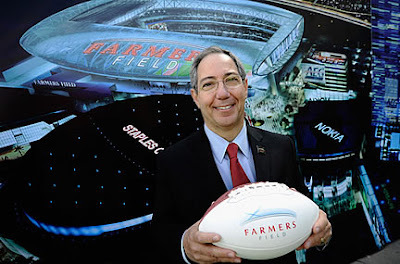 Chris: Los Angeles is trying to woo the Chargers away from San Diego, using the soon-to-be-built Farmers Field as incentive to completely crush the millions of fans the Chargers have entertained since 1960. A possible alternative to this would be creating a CGI-team to play at the new stadium, bamboozling fans and allowing Goodell to have complete control over the outcome of their games, while demonstrating how players are able to easily recover from injuries and play two games a week in a revamped, 62-game schedule. Joe: Chargers will stay put in San Diego. They just need a new GM and coach. Ralphie: I'd like to see the Chargers go there because I think "The Los Angeles Chargers" sounds cool. Brad: I don't think it's ever a good idea to move a team. Teams have a home in their home city, and fans feel like part of a family with the team. Then when a team moves, it's like it tossed its fan family away for a new one. Joe: Let an indoor football team migrate to the NFL in LA. Keep the current rivalries intact. L>A>RAMS!!!!!!!!!!!! AGAIN!!!!! AS IT SHOULD BE!!! !